Unseen by most of those who attend the Monlam, the Karmapa had worked into the early hours of the morning supervising preparations for the final day of Monlam prayers. Satisfied, that everything met his high standards, he had finally left the Monlam Pavilion at 2.00am. When people arrived for Mahayana Sojong at 5.45am, the stage had been transformed yet again, into a multicultural, visually stunning celebration of the Buddhist Dharma, the Kagyu tradition and the Monlam itself. The sixteen Chinese-style auspicious banners of the Arhats which had headed the Alms Procession the day before now lined the wings either side of the main stage, and the lowest tiers were brightened by bouquets of fresh flowers, huge chrysanthemum blooms in deep purples, whites and yellows. On the second tier, three low thrones had been placed, for the Gyalwang Karmapa and his two heart sons, Jamgon Kongtrul Rinpoche and Gyaltsab Rinpoche. The rows of gelongs sitting on the steps had been reduced from three to two, and between the second and third tier, to left and right, a new array of offerings in three rows had been arranged for the Offering to the Gurus. The first two rows comprised pyramids of persimmons, green grapes, red apples, and oranges, heaped onto silver and golden stands. Above them on the third row were two long tables. To the left were the eight auspicious symbols: the white conch; the precious umbrella; the victory banner; the golden fish; the Dharma wheel; the sacred knot; the lotus; and the treasure vase. On the right were the seven articles of royalty: the precious wheel, the precious jewel, the precious queen, the precious minister, the precious elephant, the precious horse and the precious general. The morning session began with Mahayana Sojong given by Gyaltsab Rinpoche; a fitting end to this Monlam in which he has played a greater role than previously. His Holiness came for the second session, the first part of the Offering to the Gurus. The offerings are made at the wooden pagoda shrine on the third tier, inside which a golden image of the baby Buddha stands. This image reflects the story of the Buddha’s birth at Lumbini. According to the traditional account, the Buddha was born from the right side of his mother, as she leant against a tree. When he landed on the ground, he took seven steps in each of the four cardinal directions, and lotus flowers opened beneath his feet. Pointing his right hand towards the sky, and his left towards the earth, he declared: “In all of heaven and earth, I am the most venerated one.” He was referring not to himself personally but to the Buddha nature which exists in every one. 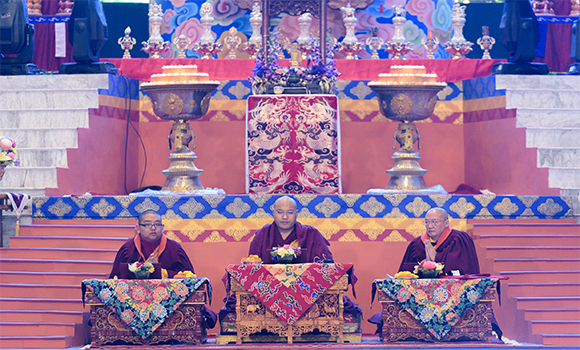 There was a special surprise for everyone this year, linking the Monlam with the Kagyu Monks’ Winter Debate. Twelve monks, drawn from all nine shedras that participated in the Kagyu Gunchoe, held a fifteen minute Tibetan-style philosophical debate. The topic was whether the ground of emptiness is shentong or a rangtong. Is it empty of other or empty of itself? There were four responders, who sat wearing traditional yellow tsesha and the yellow chögu, and eight presenters. Drawing on both quotations from scripture and logic to make their points, the monks hotly contested the topic. As the debate grew fiercer, the presenters’ actions became more vigorous, clapping their hands, stamping their feet, and shoving and pushing each other. Tibetan debate may seem combatative but actually in essence it is cooperative, as the two sides work together to help each other reach a deeper understanding of the topic. For the closing session of the 32nd Kagyu Monlam, His Holiness as befits the Head of the Karma Kamtsang, sits alone on the second tier of the stage, above his heart sons and Rinpoches. The ceremonies begin with a mandala procession in his honour. A munificent silver and gold mandala set, so large it takes 8 people to present it, occupies a prominent position. Two people hold the massive silver plate, two hold each side of the larger rings, one holds the smaller ring, and one has the crowning pinnacle of Mount Meru. The set is assembled on stage from an offering dish containing glistening saffron dyed grains which are poured out upon each ring rather than heaped by hand. The chant master has to slow down the offering chant to allow for the heaps to be piled perfectly into place. At the head of the procession is Gyatson Nyingpo RInpoche and his group from Taiwan, who have promised to sponsor the Monlam for five consecutive years, followed by Lama Kelsang, the translator Ngodrup Burkhar and Chime Dorje Rinpoche who heads a group of sixty two Taiwanese in identical duck-yellow blazers. An old man in a white chuba and long white hair is the last in a line that stretches to the back of the pavilion and out. After the assembly has chanted the Karmapa’s long-life prayer, he puts on the Activity Crown to bless the auspicious substances, the symbols of the chakravartin, the seven articles of royalty and the eight marks of auspiciousness. Each of these offerings is presented in an elaborate silver vessel that resembles a trophy, accompanied by a slow rhythmic chant. An aerial view on the large video screens gives a momentary impression of being in a cathedral. A red carpet runs down the central aisle; there are perpendicular columns on either side; a towering vaulted ceiling like a nave opens out above the stage; and perfectly proportioned on-stage symmetry draws the eye to the central icon of the Lord Buddha. (When supervising stage management, the Karmapa uses a laser pen to achieve this exact balance). It is a pageant befitting a dharma king. After these preliminaries, the Master of Ceremonies introduces the first of three main events: a special award of the Karmapa’s footprints to Lama Chodrak, Executive Director of the Kagyu Monlam and to Lama Phuntsok, originator of the Karma Gunchoe and founder of Karma Lekshey Ling Shedra in Nepal. The Karmapa begins to speak and immediately, magically, the sun’s rays enter the Pavilion, piercing the cloudy skies outside. The footprints are a symbol or representation of the Lama. So when the Lama is not present, and a transmission or lineage of empowerment has been broken, one can make offerings, recite the text with faith and devotion in the presence of the footprints, and the transmission will be restored. Secondly, if there has been a violation or breakage of samaya commitments and the Lama is not present, then one can make sincere confession in the presence of the footprints and this will restore violations of samaya. 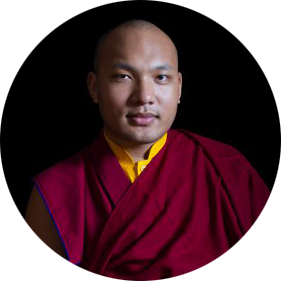 With characteristic humility, the Karmapa credits the strong belief of his devotees, the blessings of buddhas and bodhisattvas, and the Kagyu forefathers, for enabling him to make the footprint. Today, here at the 32nd Kagyu Monlam, in the presence of His Holiness, the heart sons, and all the gods and humans, he is being awarded with these blessed footprints of His Holiness, who is indivisible from Chenrezig himself, as an ornament to bear above his head and as a support for his faith and devotion. The second set of awards are for the competitions during the Kagyu Winter Debate. The Master of Ceremonies reminds everyone how His Holiness restructured the debates into a competition in order to motivate the monks, invited judges from different traditions to ensure fairness and raise standards, and produced a study book, a root text with commentary that could be studied over the first three years. Although there are prizes in each topic and for individual students, it is Jamgon Kongtrul Rinpoche’s Lava shedra which receives the award for the highest combined total of marks, making them the overall champions. Finally, awards are presented to the winners of the Grand Examination of Monastic Forms. In 2004, His Holiness Karmapa brought in reforms of dress and behaviour for the nuns and monks, based on the Vinaya. He further ensured that everyone knew about this by sending teachers such as Mingyur Rinpoche out to the monasteries and nunneries to demonstrate how things should be done. Subsequently, HH Dalai Lama and HH Sakya Trizin praised the Kagyu Monlam saying it is different from any other Monlam in the world. For the first time, this year every monk and nun was examined by a team of five judges, and prizes were awarded in two classes: gelong and gelongma [fully ordained monks and nuns], and getsul and getsulma [novice monks and nuns].There are no gelongma yet, so all three prizes in the first class are awarded to gelongs: first prize to Thrangu Tashi Choling, second to Bokar Monastery and third to Ralang Monastery. In the novice class however, monks and nuns have competed together. The first prize is awarded to Karma Drubdey Palmo Chökyi Dingkhang Nunnery in Bhutan, the second prize to Yongey Tergar Monastery and the third prize to Tilokpur Nunnery. As dusk draws in, a cold moist air again settles on the fields surrounding the Pavilion. The Karmapa’s closing speech is brief. Mainly I’d like to say thank you to all the lamas, tulkus, masters, monks and nuns, especially the two Eminences. And all the members of the public who’ve come from far away –thank you all from the depths of my heart. In particular, I would like to thank this year’s sponsors of the Kagyu Monlam. Gyatson Nyingpo Rinpoche has been the primary sponsor for the last two or three years and this is something I rejoice in. All the roots of virtue you’ve gathered, you should dedicate to the benefit of all sentient beings. If you can do this, your roots of virtue will spread throughout space. The 32nd Kagyu Monlam has been good in the beginning, the middle and the end. We’ve all gathered together. You don’t see everyone who’s working hard – those in the back, you don’t really see much. All those we see and those we don’t see who’ve all worked together and cooperated in this, we rejoice in their work and say thank you. I’d like to express my gratitude to them as well. The Umdzes lead the assembly in chanting numerous prayers of auspiciousness, but the one closest to the hearts of the people is the aspiration of Mikyo Dorje in honour of the previous Karmapa, Chodrak Gyatso, and his Great Encampment. A blaze of good fortune, the ornament of the world! May the teachings of the Practice Lineage flourish! May the world have the good fortune of happiness! We ask that the world be made happy! A great cry of joy resounds as the 17th Karmapa steps with dignity out of the massive theatre while white scarves fly in the air proclaiming victory.